Linda Darling-Hammond is president of the Learning Policy Institute and the Charles E. Ducommun Professor of Education Emeritus at Stanford University, where she founded the Stanford Center for Opportunity Policy in Education and served as the faculty sponsor of the Stanford Teacher Education Program, which she helped to redesign. Darling-Hammond is past president of the American Educational Research Association and recipient of its awards for Distinguished Contributions to Research, Lifetime Achievement, and Research-to-Policy. She is also a member of the American Association of Arts and Sciences and of the National Academy of Education. From 1994 to 2001, she was executive director of the National Commission on Teaching and America's Future, whose 1996 report What Matters Most: Teaching for America's Future was named one of the most inﬂuential reports affecting U.S. education in that decade. In 2006, Darling-Hammond was named one of the nation's 10 most inﬂuential people affecting educational policy. In 2008, she served as the leader of President Barack Obama's education policy transition team. Darling-Hammond began her career as a public school teacher and cofounded both a preschool and a public high school. Among her more than 500 publications are a number of award-winning books, including The Right to Learn, Teaching as the Learning Profession, Preparing Teachers for a Changing World, and The Flat World and Education. Channa M. Cook-Harvey is the director of social and emotional learning at Folsom Cordova Uniﬁed School District. In collaboration with Instructional Services and Special Education, she is working to strengthen FCUSD's efforts to educate the whole child. In this role, she provides leadership, planning, coordination, and management to support the development of infrastructure that creates the conditions, culture, and competencies to guide social-emotional learning districtwide. Previously, Cook-Harvey was a senior researcher at the Learning Policy Institute in Palo Alto, CA. 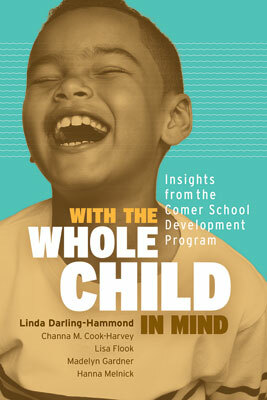 There, she collaborated with colleagues to lead, design, and manage complex national and California-based qualitative education research studies focused on social-emotional learning, whole child approaches to schooling, and trauma-informed practices. She began her career in education as a high school English teacher and literacy coach in Los Angeles Uniﬁed School District, and she cofounded and served as principal of a charter school in New Orleans. Lisa Flook holds a PhD in (Clinical) Psychology from UCLA. She is a senior researcher at the Learning Policy Institute, involved in translating research on children's learning and development to inform practice and policy. She has conducted research in educational settings for over 15 years. Her earlier research focused on the negative consequences of academic and interpersonal stress on children and adolescents. A strong interest in prevention and intervention led her to investigate approaches to mitigate the negative effects of stress and to promote health and well-being starting in childhood. She has studied the effects of mindfulness in school settings at UCLA's Mindful Awareness Research Center and at the Center for Healthy Minds at the University of Wisconsin-Madison. Madelyn Gardner is a research and policy associate at the Learning Policy Institute. There, she has conducted research on issues of access and quality in state early learning systems and on effective preparation and development of teachers and school leaders. Previously, Gardner worked at the Next Generation think tank, where she supported evidence-based children and family policy development in California, and taught English as a foreign language at Payap University in Thailand. She holds an MA in International Education Policy from Stanford University. Hanna Melnick is a research analyst and policy advisor at the Learning Policy Institute, where she coleads the Early Childhood Learning team. Her research there has focused on school climate, social and emotional learning, accountability, and building effective early learning systems. Previously, Melnick conducted research on California's Local Control Funding Formula and early learning systems. She began her career in education as an elementary teacher. Melnick holds an MPP from the Goldman School of Public Policy at UC Berkeley and received her BA from Harvard University.